Explanation: Winds on Mars can't actually blow spacecraft over. But in the low gravity, martian winds can loft fine dust particles in planet-wide storms, like the dust storm now raging on the Red Planet. From the martian surface on sol 2082 (June 15), this self-portrait from the Curiosity rover shows the effects of the dust storm, reducing sunlight and visibility at the rover's location in Gale crater. Made with the Mars Hand Lens Imager, its mechanical arm is edited out of the mosaicked images. Curiosity's recent drill site Duluth can be seen on the rock just in front of the rover on the left. The east-northeast Gale crater rim fading into the background is about 30 kilometers away. 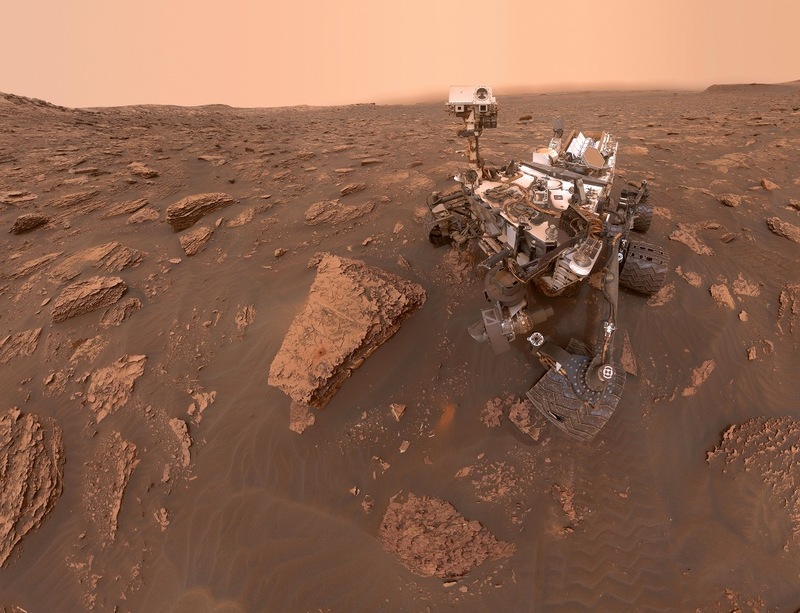 Curiosity is powered by a radioisotope thermoelectric generator and is expected to be unaffected by the increase in dust at Gale crater. On the other side of Mars, the solar-powered Opportunity rover has ceased its operations due to the even more severe lack of sunlight at its location on the west rim of Endeavour crater.